Protecting newborns from two serious, possibly deadly illnesses — whooping cough (or pertussis) and flu — starts with Mom before baby is born. As we honor moms this Mother’s Day, the physicians of the Texas Medical Association (TMA) urge pregnant moms and moms-to-be to get recommended shots to protect themselves and their babies. The Centers for Disease Control and Prevention (CDC) recommends women get the Tdap vaccination (a combination vaccination that protects against tetanus, diphtheria, and pertussis) during each pregnancy. While the vaccination may be given any time during pregnancy, CDC suggests pregnant moms receive it between 27 and 36 weeks of gestation, or during the third trimester. The same is true of mom’s flu shot, which she can get anytime during pregnancy: It provides protection both to her and to the baby. Flu is dangerous for both pregnant women and babies. It can put pregnant women in the hospital or even kill them, and babies too. Expectant moms with flu also have more risk of problems for their unborn baby, including early labor and delivery. Because babies can’t get their flu shot until they are 6 months old, mom’s flu vaccine helps pass on protection to the little one. Vaccination advice does not pertain just to mom, though. Because babies can catch pertussis from anyone near them, physicians recommend all those who will come into contact with the baby be up to date on their whooping cough vaccination, including parents, siblings, grandparents, childcare providers, and health care workers. For the best protection, CDC recommends family members get the pertussis shot at least two weeks before they have contact with the baby. And because babies don’t always arrive on their due date, getting vaccinated a few weeks before the anticipated birth is best, said Dr. Hampton. Flu, too, is passed easily from person to person. CDC recommends flu shots each year for anyone over 6 months of age, so that means all family members and caregivers should be vaccinated for flu, as well. If you’re pregnant, physicians recommend you ask your doctor about Tdap and flu shots. 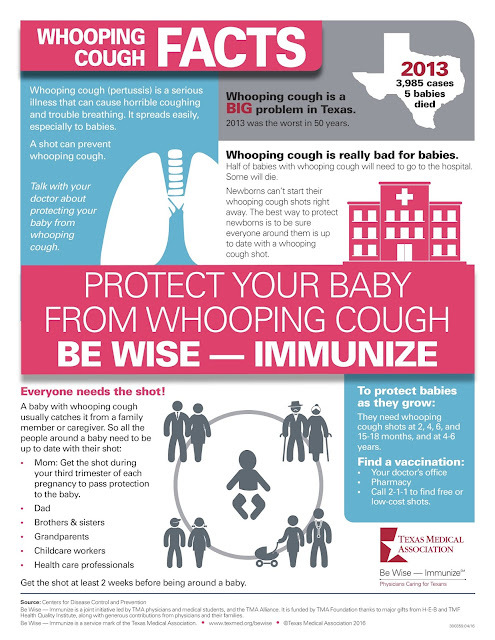 TMA published a whooping cough infographic (see below) and whooping cough fact sheet, in English and Spanish. TMA also has a flu infographic and flu fact sheet in English and Spanish.